Ever wondered, “Why does my cat follow me?” You’re not alone! We take a look at some of the reasons why your cat — and even stray cats — might follow you. Most times when I walk to the kitchen, my cat, Mimosa, decides to follow me. I’ve always put this down to the unflinching pursuit of food. Her treats are stored on the countertop, and her nightly wet food treat is served up in a bowl kept in a kitchen cupboard. It makes sense for Mimosa to chance her luck whenever I enter the kitchen. But it turns out there might be more reasons why a cat would follow a human around. If you’ve ever found yourself wondering, “Why does my cat follow me?” here are some of the answers. 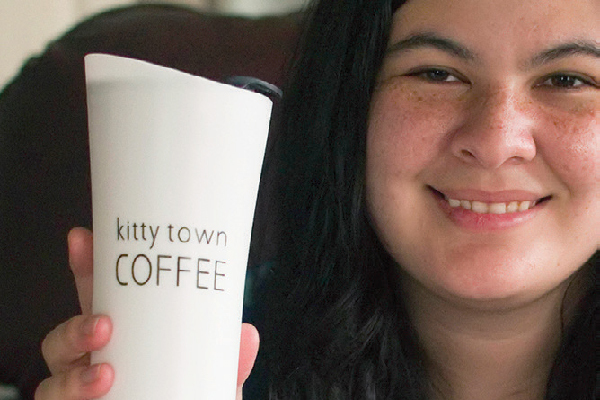 Ever wondered, “Why does my cat follow me?” You’re not the only kitty parent out there! Photography ©krblokhin | iStock / Getty Images Plus. One of the answers to, “Why does my cat follow me?” is that a cat following you around might be learned behavior that stems from her kitten days. Despite the image of cats as highly independent creatures, young kittens learn about life by following their mothers. This is sometimes called the mother-kitten connection. A kitten quickly learns that trailing her mother around will provide food, play, safety and affection — pretty much all the things a human ends up undertaking when they adopt a cat. 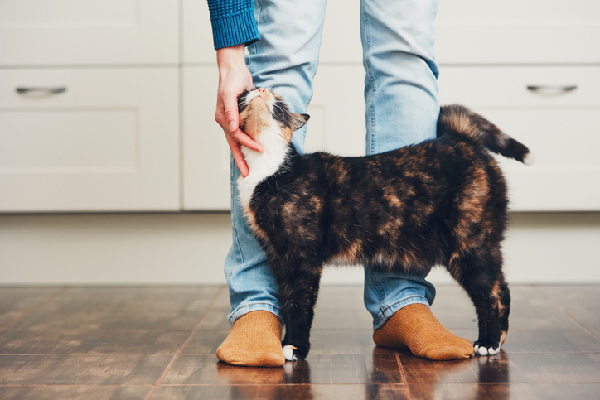 Jacqueline Munera, a Certified Cat Behavior Consultant at the International Association of Animal Behavior Consultants, builds on the point by adding that these sorts of positive interactions — which also include allogrooming activities like brushing and petting — help forge a bond between cats and their humans. So, the next time you find yourself asking, “Why does my cat follow me?” the first answer could be it’s a case of carrying out learned behavior. Why Does My Cat Follow Me? Is It a Sign of Affection? 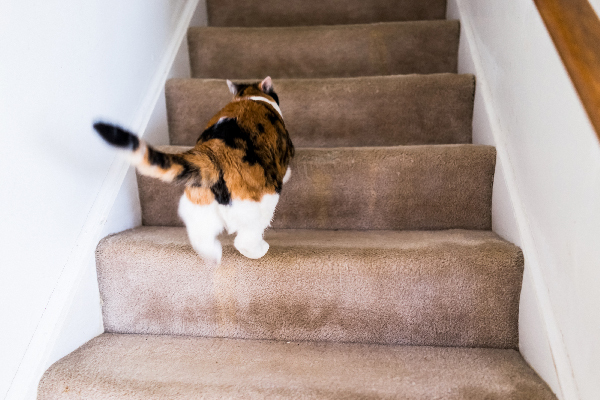 The second question after wondering, “Why does my cat follow me?” is to ask whether her habit of trailing you around is a form of cat affection. There might also be an element of your cat missing you going on — especially if you’re away from the house all day for work commitments. This can take the form of your cat following you around when you return and acting like she’s trying to instigate a play or petting session. How Should You Reciprocate Your Cat Following You and Other Signs of Cat Affection? It’s important to acknowledge and return the affection your cat shows when she follows you around — but make sure to do so in a way your cat appreciates. “Owners can learn about cat body language so that they will be better able to understand their cat’s communication signals,” she adds. Why Does a Stray Cat Follow Me? We may have answered the question,”Why does my cat follow me?” but what should you do if you notice what seems to be a stray cat following you outside? If a cat continues to follow you outdoors, maybe she’s an indoor cat that’s lost. Check the cat for a collar or tags. Scan local listings or social media alerts to see if someone is searching for a cat with a similar description. If the cat doesn’t seem friendly, Jacqueline recommends watching her body behavior to try and judge if the cat is acting in a threatening or scared manner. Although she adds, “This is generally not a very common problem because most feral cats leave humans alone.” Check to see if the cat’s ear has been tipped – the universal sign that a feral cat has been spayed/neutered. If not, consider getting the cat spayed/neutered through a local TNR program. Thumbnail: Photography ©Chalabala | iStock / Getty Images Plus. Montana follow me around, she will also ask to be picked up, YES she does, She will stand in front of me 7 stand up with her front paws on my leg’s. My other cat *Damie* will also follow me, when I stand still, she will take one of her back paws & stand on my foot. I love my two girls, They both are *Savannah’s*, very loving cats. My Damie likes to follow me around, when I stand still, Damie will put one back paw on my foot. before any one gets a *Savannah* do your home work, talk to owners/breeders, they arent your everyday house cat, they need A LOT of attendtion, interaction. I don’t know why anyone would criticize you! I think it’s wonderful to have such close bonds with our fur babies. I have a 1 yo male tuxedo we rescued at 4 wks old, mainly for my daughter but he’s very bonded to me. He follows me everywhere, sleeps with me, purrs n licks me, “talks” to me & I love it! He’s my boy. My calico, Cha Cha, is a “herding” cat. She gets in front of me to make sure she directs me to the kitchen. She also follows me to other rooms and seems to know when I am getting dressed to leave the house. So funny! One of my Bengal cross kittens, 7 months old, doesn’t so much follow me, as precede me. He just has to be in front of me wherever I go in the house! Almost as if he’s making sure that it’s safe for me to do whatever I’m doing, so funny. No more solo bathroom visits, or bath time, and their favourite time of the day seems to be what I call ‘cooking with mother’. Come dinner prep time they are both there ready to help, should get them some kitty aprons! I love the dearly, but they are without a doubt the craziest cats I have ever been blessed to have in my life, so glad I got them. I have seven cats and most of them follow me around at various times…when not sleeping . Some seem VERY kittenish while doing so, others just nosy.I think it depends on the cats personality and strength of their bond with you. They follow me more than they do my husbsnd…they also pester me for tiny bits of whatever I’m eating…and don’t bother him at all. I recently adopted a cat two weeks ago. It was told to me that he is 2 years old. He has a few odd behaviors. One is, he chews on boxes. Really tears them apart and I don’t understand why. Could he accualy be a kutten instead? And he does follow me around all the time. I think that is normal curiosity. What do you you think he tears boxes apart? My Saphira (calico) used to follow me everywhere but she had more of the “what are we gonna do now” attitude. Now my Figaro (tuxedo)follows me to see if I’m going to feed him, but my husband thinks it’s because he loves me. I hope so because I sure love him! And yes, sometimes there’s a little affection too, but never forget that most toddlers have not yet learned to think about anyone but themselves. Nor have some cats. I have a 14 month old ragdoll. This breed is known to follow their human. I am “momma” to Scarlett. She always follows me around the house. If she can’t see me, she will trill until I call her name. We even play hide and seek and she plays fetch and sleeps right beside me. This is my second ragdoll and the first one did the same thing. It’s so nice to have my “babydoll” beside me. She’s a wonderful companion!